Rendering of Four Winds South Bend. Courtesy of the Pokagon Band of Potawatomi Indians and its Four Winds Casinos. SOUTH BEND, IN--(Marketwired - Dec 7, 2016) - The Pokagon Band of Potawatomi Indians is pleased to announce that it has started construction on a new casino located on its Trust Land in South Bend. 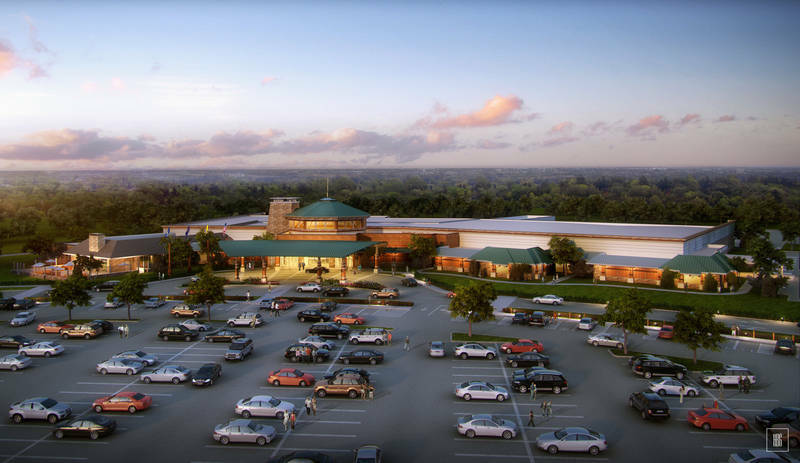 The casino will be called Four Winds South Bend, sharing the Four Winds brand with other Pokagon casino locations including New Buffalo, Hartford and Dowagiac, Mich. The first phase of Four Winds South Bend will have 175,000 square feet and include 1,800 Class II gaming devices, four restaurants, a player's lounge, a coffee shop, three bars, a retail outlet, and approximately 4,500 parking spaces including an enclosed parking structure. The casino is scheduled to be complete in early of 2018 and will employ approximately 1,200 people. Approximately 700 jobs will be created during construction. "We are very excited to begin construction on Four Wind South Bend. Once operating, it will generate revenue to fund services and programs that will create additional economic opportunities for Pokagon Citizens, the city of South Bend, and also fund community projects, local organizations and schools," said John P. Warren, Chairman of the Pokagon Band of Potawatomi Indians. "On behalf of the National Indian Gaming Association (NIGA), I would like to congratulate the Pokagon Band on its historic 166 acre Tribal Homeland Restoration," said Ernie Stevens Jr., Chairman of NIGA. "This 22-year journey has been a long one for Pokagon Citizens. We are happy to see the United States fulfilling its promises from Treaties made long ago. It is only fair and just for the sacrifices our Elders made on our behalf." "When Four Winds New Buffalo opened nine years ago, it set a new standard for gaming in the Midwest. It has since received more than 300 local and national awards," said Frank Freedman, Chief Operating Officer of Four Winds Casinos. "Four Winds South Bend will offer the same high-level of service and amenities that our guests have come to expect including signature restaurants such as Copper Rock Steakhouse and The Buffet. We look forward to providing more details on the property as well as information about job fairs and vendor fairs as we progress through construction." Partners supporting the Pokagon Band and Four Winds Casinos in the construction of Four Winds South Bend include: Architect, HBG Design, Memphis, Tenn.; Civil Engineer, Wightman and Associates, Benton Harbor, Mich.; Construction Management Company, F.A. Wilhelm, Indianapolis, Ind. ; and Owners Representative, Kramer Management Group, Lansing Mich.. The Pokagon Band of Potawatomi Indians' sovereignty was reaffirmed under legislation signed into law by President Clinton in September of 1994. The Pokagon Band is dedicated to providing community development initiatives such as housing, education, family services, medical care and cultural preservation for its approximately 5,000 citizens. The Pokagon Band's ten-county service area includes four counties in Southwestern Michigan and six in Northern Indiana. Its main administrative offices are located in Dowagiac, Mich., with a satellite office in South Bend, Ind. In 2007, it opened Four Winds Casino Resort in New Buffalo, Mich., followed by Four Winds Hartford® in 2011 and Four Winds Dowagiac® in 2013. More information is available at www.pokagonband-nsn.gov. Four Winds® New Buffalo, located at 11111 Wilson Road in New Buffalo, Mich., Four Winds Hartford®, located at 68600 Red Arrow Highway in Hartford, Mich., and Four Winds Dowagiac®, located at 58700 M-51 South in Dowagiac, Mich., are owned by the Pokagon Band of Potawatomi Indians. Four Winds New Buffalo offers 130,000 square feet of gaming with more than 3,000 slot machines, 60 table games, five restaurants, entertainment bars, retail venues, a pool, and a 415-room hotel, making it the premier gaming resort in the Midwest. Four Winds Hartford features more than 550 slot machines, nine table games, a 74-seat restaurant, and a 15-seat bar. Four Winds Dowagiac features 400 slot machines, seven table games and one restaurant. Please play responsibly. You must be 21 years of age to gamble. For more information on Four Winds Casinos, please call 1-(866)-4WINDS1 (866-494-6371) or visit www.fourwindscasino.com. Additionally, be sure to like Four Winds Casinos on Facebook at www.facebook.com/fourwindscasino and follow on Twitter at www.twitter.com/fourwindscasino.